http://www.JewishWorldReview.com | Last June, during a NATO summit in Istanbul, US President George W. Bush blamed the dictatorial rulers of the Arab world and their supporters for the culture of extremism that engenders terrorism and hatred of the West. Bush said, "In the last 60 years, many in the West have added to this [state of affairs] by excusing tyranny in the region, hoping to purchase stability at the price of liberty. But it did not serve the people of the Middle East to betray their hope of freedom and it has not made Western nations more secure to ignore the cycle of dictatorship and extremism." The fact that, in the midst of a reelection campaign in which he was being pilloried for alienating Europe and Turkey by invading Iraq, Bush stood in front of his erstwhile NATO allies and essentially told them they were advancing the cause of terror, speaks volumes for the president's seriousness in pursuing his strategy of victory through the democratization of the Arab world. The European reactions to Bush's speech were highly suggestive. French President Jacques Chirac sent his new foreign minister, Michel Barnier, to pay his first visit to PLO chieftain Yasser Arafat and spend the night in his Ramallah compound. British Prime Minister Tony Blair stood next to Bush at a news conference and conflated Bush's Greater Middle East Initiative of spreading democracy regionally with establishing a Palestinian state. The question of how Palestinian statehood fits into the Bush Doctrine of democratization has always been a nagging one. The president's central premise is that the endemic wars and terrorism in the region are the consequence of repressive regimes that prefer their people be raised on a diet of extremism and hatred under tyrannical governments than be educated in moderation and modernity under free governments. Rejection of Israel's right to exist by the Arabs who need Israel (and America) as their external enemy in order to justify the failure of their own leaders to advance their peoples is, by the reasoning of the Bush Doctrine, the central cause of the Arab-Israeli conflict. On the other hand, the idea that there must be a "two-state solution" in which a Palestinian state  empty of Jews at its inception  is created in Judea, Samaria, Gaza and Jerusalem comes in response to a completely different set of operating assumptions. These assumptions are not American, but European. According to them, the cause of wars and Arab terrorism is not Arab tyranny and religious extremism but a lack of Palestinian sovereignty. The Arab conflict with Israel, according to this view, will be resolved when a "viable and contiguous Palestinian state" is founded in a Jew-free Judea, Samaria, Gaza and Jerusalem. Today the Bush Administration, together with the Sharon-Peres government, is pushing the view that Sharon's withdrawal and expulsion plan for Gaza and northern Samaria is aligned with the Bush Doctrine. Among the Palestinians and the Israelis, however, it is becoming increasingly clear with each passing day that not only is there no connection between the two, but that there is a glaring contradiction. This week, MK Azmi Bishara's Web site, www.Arabs1948.com, published an interview with Hamas spokesman Ahmed al-Bahar in which he discussed the significance of Sharon's plan. Bahar claimed, "The painful and qualitative blows which the Palestinian resistance dealt to the Jews and their soldiers over the past four and a half years led to the decision to withdraw from the Gaza Strip." "All indications show that since its establishment, Israel has never been in such a state of retreat and weakness as it is today, following more than four years of the intifada," he continued. "Hamas's heroic attacks exposed the weakness and volatility of the impotent Zionist security establishment. The withdrawal marks the end of the Zionist dream and is a sign of the moral and psychological decline of the Jewish state. We believe that the resistance is the only way to pressure the Jews." There can be no clearer exposition of the Palestinian view that Israel's plan to hand over strategic assets to its enemy in the midst of war and receive nothing in return is a victory for terror than Bahar's statement. From the political developments of the past couple of weeks inside of Israel it is clear that the overwhelming majority of Israelis also view Sharon's plan as a victory for terrorism. So it is that without exception, the entire left wing of the political spectrum, with the support of the anti-Zionist Arab MKs and the post-Zionist Yahad faction, supports Sharon's plan. And almost without exception, every member of the right wing of the Israeli political spectrum  which does not include Sharon loyalists like Ehud Olmert and Tzipi Livni  either opposes Sharon's plan or demands that a national referendum on the plan be held before any withdrawal of forces or expulsion of Israeli citizens is carried out in Gaza and northern Samaria. It took a while for the significance of Sharon's plan to become clarified for Israelis. As recently as last month, many voices on the Left were still questioning whether Sharon had something up his sleeve that they didn't know about. Yet as time passed, and Sharon became increasingly shrill in his defense of his policies  while demonizing and firing anyone who voiced opposition to or doubt about the wisdom of his plans  its significance sunk in for everyone. As a result, today it is well nigh impossible to find an Israeli or a Palestinian who will argue that Sharon's withdrawal plan can in any way be linked to, or made to agree with, the Bush Doctrine. Given the total disconnect between the Bush Doctrine, which places the onus for change on the Arabs by calling for their democratization and eschewal of terrorism, and the Sharon plan, which makes no demands whatsoever on the Palestinians, it was interesting to see an attempt to conflate the two undertaken by as remarkable an intellectual and as heroic a figure as Norman Podhoretz. In the April issue of Commentary magazine, Podhoretz, who has been a towering intellectual model for me throughout my career, argues that there is a way to view the Sharon plan as part of the Bush Doctrine. He claims that after Israel removes the Jewish communities from Gaza and northern Samaria, the Palestinians will be held to the Bush Doctrine's policy of democratization  and that Israel won't be forced to make any additional concessions until the Palestinians reform. He argues that if the Palestinians continue to attack Israel after the IDF evacuates the Jewish communities and withdraws from the areas, Israel will be free to take any action it deems necessary to secure itself. He claims that because of Bush's commitment to the Bush Doctrine, the Arab world will now be forced to enact reforms that will transform the Palestinians' operating environment in a manner that will force them to give up terror. While it is possible to debate the merits of each of the points he made in favor of the plan, what is most interesting about Podhoretz's analysis of Sharon's plan is the point he does not address. Podhoretz never discusses what Israel is actually accomplishing  for itself  by going forward with Sharon's withdrawal and expulsion plan. 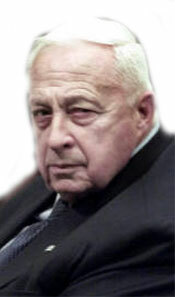 Again, as is now clear to all Israelis and Palestinians, the reason it is impossible to discuss what Israel is actually gaining from Sharon's plan is because Israel is gaining nothing from it. MK Uzi Landau, who leads Sharon's opposition in Likud, flew to the US last week to speak to American Jewish audiences. He spoke mainly to local groups, as he explains that the main Jewish organizations  the United Jewish Communities and AIPAC  have refused to allow any opponents of Sharon's plan to address their audiences. This, he says, is the result of pressure on the groups by Sharon's office. "What I found every time that I spoke," Landau relates, "is that the American Jews had absolutely no knowledge of the problems with Sharon's plan. No one has ever discussed them. No one has ever been afforded the opportunity to discuss what will happen the day after Israeli forces pull out of Gaza. No one has ever been able to talk to them about the financial and security and political costs of the plan. No one has ever been allowed to discuss with them the ecological consequences of the plan." Given the fact that in Israel it took time before the significance of Sharon's plan was fully understood, it makes sense that in the US it could take a bit longer for the strategic logic  or irrationality  of Sharon's plan to become clear. When the Rabin-Peres government announced the Oslo process 12 years ago, giving the PLO land, legitimacy and arms in exchange for intangible promises of peace, American supporters of Israel  both Jewish and non-Jewish  were quick to declare either their support for or opposition to Oslo. The vast majority supported it. Once they had publicly declared their support for the policy, even when it literally began blowing up in Israel's face, they refused to countenance that they were wrong to have done so. The fact that the current policy of expulsion and retreat is being enacted by Sharon  the great general and right-wing tactician  is a source of confusion for many who are looking for a catch that will explain and justify his adoption of a radical, left-wing plan. Hopefully, once the supporters of Israel  who, like Podhoretz, were brave enough to ignore the conformist pressures and oppose Oslo  come to accept the fact that Sharon's policy involves many risks but provides no opportunities, they will not hesitate to disavow it. And again, hopefully, at that point they will demand that the US policy toward the Palestinians be brought into line with the Bush Doctrine. JWR contributor Caroline B. Glick is the senior Middle East Fellow at the Center for Security Policy in Washington, DC and the deputy managing editor of The Jerusalem Post. Comment by clicking here. here.